This weekend I had the opportunity to photograph exotic cars at the Tour d'Elegance in Winter Park, Florida. What a treat - the most beautiful cars I've ever seen in one place. The engine detail above is from "Tuff Enuff" - based on a 1950 Mercury creatively handcrafted by Gary "Chopit" Fioto. It's entirely amazing! Tinkering with this engine was great fun! To start with, it was photographed in HDR, three exposures to capture the dynamic range in the composition. It was processed using the Photomatix Tone Mapping filter working more with micro-smoothing, and less with micro-contrast. 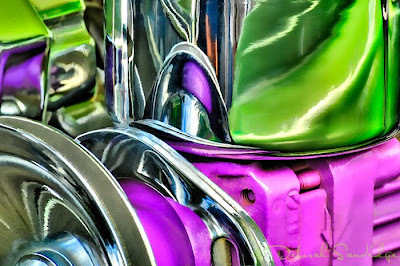 The colors were wonderful for a car engine, purple and green, who would have thought? To accentuate the abstract and painterly feel to this image, I used several Photoshop plug-ins. Try Topaz Labs Simplify, Adjust and Detail, a trio of my favorites!